It’s been an exciting year at The Contemporary Pet. We’ve interviewed some of the best pet experts in the business, worked with pet shelters and updated our followers on the highs and lows of pet ownership on a personal level. Our lowest point, the death of our tortoiseshell cat Peanut Butter, was also one of the most inspiring. Condolences rolled in from around the world, confirming our conviction that pet parents are some of the most compassionate people you can find. In 2017, we wrote on a wide range of subjects related to pet health, training and happiness. We decided to go back and see what posts on The Contemporary Pet interested our followers the most so that we can continue to focus on the pet topics that interest you the most. Eight Cat Myths Proven Wrong We delved into the many myths and old wive’s tales surrounding felines. From drinking milk to being dangerous around babies, we debunked the most common superstitions about cats. 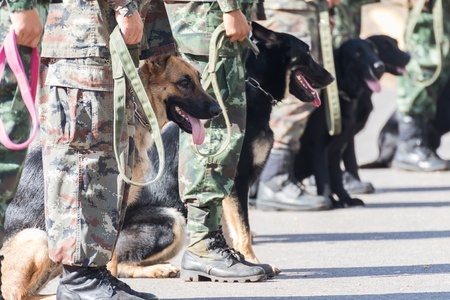 War Dogs: A Brief History of Military Working Dogs Back in March of 2017, we posted a short history of dogs who have served in the military in a variety of capacities from World War II to present day. It’s obvious many of you have an interest in military dogs and all they’ve achieved. Can the Runt of the Litter be a Good Pet? We turned to our readers for this question from a reader. Pet parents who had chosen the runt of a litter for their own families weighted in on the pros and cons of considering the runt and what the biggest challenges were. Home Décor for Pet Lovers: The 2017 Gift Guide was a cornucopia of home décor items, all with a pet-centric twist. From sweet little animal planters to commissioned oil paintings of your pet, we found lovely gifts for every budget. Our perennial Rainbow Bridge page isn’t just a post. It’s a special page where everyone can publish a photo and short tribute to the pets they’ve loved and lost. We encourage anyone who has lost a pet to post here so that their memories will carry on and others can see why your pet was so special. Please feel free to post your tribute and a photo of any animal you’ve loved and had to send over the Rainbow Bridge. 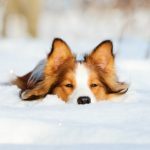 Winter Blues: Pets Get Them, Too The popularity of this post proves that lower temperatures and less sunlight affect pets as much as people. We outlined the signs of depression in pets and how to cope with them so that both you and your furbabies can enjoy winter more. Keeping Your Bored Pet Entertained While Home Alone We worry about our pets when we have to leave them alone. Are they bored? Frustrated? Scared? This post gave you suggestions for keeping your dog or cat entertained and out of trouble while you’re away. Are Topical Flea Preventatives Losing Their Effectiveness? The Contemporary Pet got a lot of comments from pet owners who read this article and echoed our frustration about the ineffectiveness of some brands of topical flea preventatives. We discussed alternative treatments and what to do when your pet’s flea treatment fails. 2. Dog Proofing Your Home for Your Senior Pet Loving our senior pets requires a lot of patience and strength. Older dogs often develop a Canine Cognitive Dysfunction (CCD), a form of canine dementia. They may also develop mobility issues and a variety of age-related illnesses. This popular post addressed ways to make your home more comfortable for the senior pets we love. 1. National Black Cat Appreciation Day is August 17 A surprising winner! This article got truly impressive traffic in 2017, proving that lots of cat lovers also appreciate the unique beauty of black cats. It was forwarded numerous times, making it the favorite post of 2017 at The Contemporary Pet. There are lots of interesting facts about black cats and their history to entertain and inform you, so take a peek if you haven’t read it yet! As we move into 2018, The Contemporary Pet will continue to bring you health care, training and other pet care tips as well as informative articles on topics ranging from how to do pet first aid to how various breeds of dogs and cats were developed. We’ll also have gift guides, honest pet product reviews and the opinions of experts so that you can give your pets the life they deserve! Oh I love this post. I’ll have to check out a few of your links…particularly the cat myths, home decor and Rainbow Bridge posts. Will share this too. I love that you have a perennial pet page for those we have lost. Great round up for the year and a way to look forward to new posts in 2018! It’s going to be a great year for you. Thank you so much! Yes, the Rainbow Bridge page is close to my heart. I still have photos displayed in our house of every pet I’ve ever lost. It comforts me to think that others will read about my lost fur babies and, for a few moments, remember them. You had a busy year! These are quality posts, which take a lot of time and hard work to write throughout the year. I’m also looking forward to what 2018 brings for your blog. Thank you so much, Lola! You’re such a talented writer yourself that your praise is doubly appreciated. I’m excited about 2018 as well. I’m hoping to have not only new interviews and product reviews, but a few series focused on specific topics of interest to my readers. Very interesting that your black cat post was the most successful! My favorite was your post about the winter blues. I think all living things really are impacted by lack of fresh air and sunlight. Sunlight is so important that some doctors now prescribe special lights that mimic sunlight for people who get the winter blues. Great roundup. I always love reading about dogs who serve in a special way; service dogs, military and police dogs. They amaze and inspire me so much. Thanks, Cathy. I’m with you – military and police dogs are serving in such dangerous and important ways. They should always have our support and admiration. Our black cat day post surprised us with the strong response we got. Just outside our top ten I am encouraged by your strong response too. This year we will try harder on Black Cat Appreciation Day! We don’t have dogs but when Dusty was a senior cat we had a lot on our hands. Plastic everywhere (he has IBS) and we used a lot of cleaner, but I do not regret our senior pets for a moment. It is so fantastic to read you had a great year with your blog and prayer 2018 will be fantastic for you too. I love what you have blogged about up till now and really enjoy your posts. I must go check out the home decor for pet lovers post! Can one person have too many dog centric picture frames? I think not but maybe I will find some more decorations! I’ve read some of these posts, but need to visit others. I need to revisit my most popular posts. I think the 12 Days of Catmas pushed everything else on the back burner as far as visits. LOVING this post!! I can’t wait to read those I missed and revisit a few favorites! One that I missed was the one on runt of the litter. My granddog Link was the runt. The only con I have seen is he is often timid at feeding time. He looks around to be sure no other animal is lurking and he prefers I am in the room with him. Otherwise, he is the BEST pup EVER and gives TONS of cuddles and love! Black cats are definitely loved and appreciated by many. My original Black Cat Appreciation Day post from 2013 still comes in in my top 20 each year. Heading over to check out your cat myths post. We’re so glad you like black cats as much as we do. I guess lots of people agree with us – still ranking in the top twenty after five years? That’s impressive! We hope you enjoy the cat myths post! What a cool variety of topics, I have bookmarked this post to come back and read. I love that you have a perennial Rainbow bridge page. Your shares on your Black Cat Appreciation day post is impressive, yay for the black kitties! I’m new to your blog, and it looks like you write on a great variety of topics! I will definitely have to check these out! And hey, I’m not surprised that the black cat post is number 1! Black cats are awesome! Welcome! We hope you’ll continue to visit us! I agree with you about black cats being awesome! I’ve had both black cats and black dogs in the past and every one of them had super personalities and were so beautiful! You really covered a wide variety of topics and each has so much value to your readers. I’m looking forward to reading your 2018 posts! Thanks so much, Amelia! I’ve been enjoying your website as well!